Just watch any broadcast of the evening news in the United States, and it’s hard not to think that this country is going to hell in a handbasket. Our government is totally dysfunctional; deadly drought, rampant wildfires and countless other natural disasters plague the continent; and shocking violent acts have pitted policemen against the population they vow to protect. It’s all terribly depressing, isn’t it? Well, dear readers, in the spirit of misery loving company, we thought you might enjoy knowing that things aren’t much better in the marmot world. When we were hiking last summer in India, we had the opportunity to observe these furry creatures on several different occasions, and, believe you me, we were absolutely stunned by what we saw. 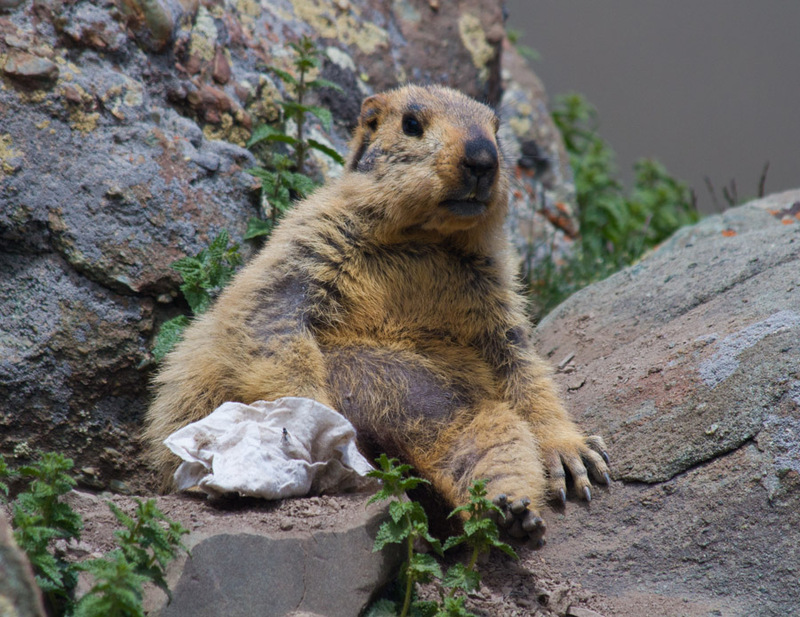 Now normally, marmot culture is pretty chillaxed. We’ve run into them numerous times while hiking here in the US, and there was absolutely no cause for concern. They were all doing their natural marmot things: lazing in the sun on warm rocks, frollicking in fields of lupine, and whistling to each other whenever a stranger wandered into their neighborhood. We have to admit, traditional marmot life seems like a pretty idyllic existence. If this whole teacher thing doesn’t work out, we might be tempted to give it a try. But that was then. It seems that today is a whole ‘nother story. 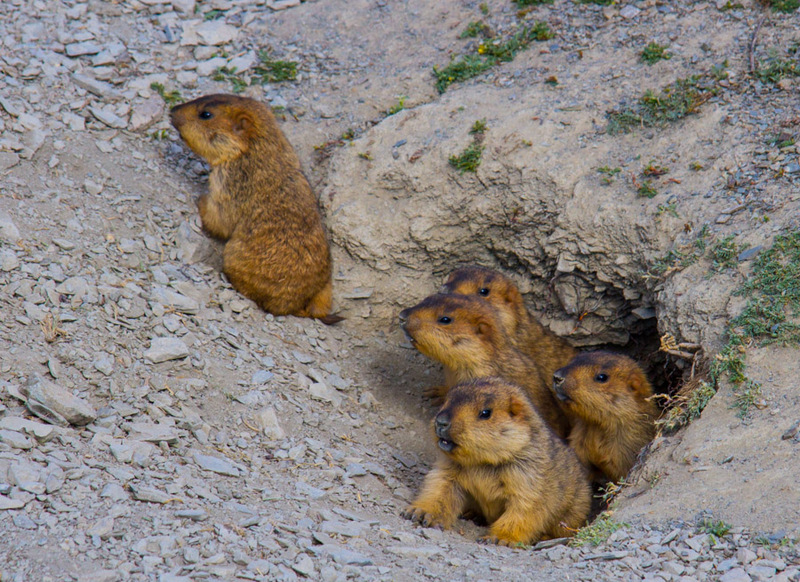 For example, we ran into a gang of young marmots on the trail on a day trip to Ganda La in Ladakh, and their parents were nowhere to be seen. The little critters were left at home, unattended, with absolutely no adult supervision, like latch-key children. Yeah, that’s right, “Go ahead kids, help yourself to whatever you find in the refrigerator” or “Make yourself a dang quesadilla, Napoleon.” What’s to become of young children when parents simply jet off to the meadow to sit by a patch of flowers and sun themselves leaving their kids all alone? Never mind the fact that these little guys weren’t getting their homework done. With the front and back doors unlocked, these young marmots simply sat on the front porch of their marmot holes, idly watching as these two humans edged their way closer and closer with loaded cameras aimed right at them. They didn’t have a care in the world, no sense of danger, not worried in the slightest that their images would be spread all over social media. Another clear sign that Marmotsville is definitely on the decline is an alarming rise in the practice of hoarding trash. I mean, we all like to collect stuff, right? Some of us take it to extremes, collecting old National Geographics, bobble heads or expensive camera gear. They even make TV shows now about folks who go too far in their obsession for stuff. It’s just really sad to see that this social ill has bled over into the marmot world. Something is rotten in the state of Marmotsville! “O Tempora, O Mores” What is the marmot world coming to?!?! Hilarious! I can’t believe they get that big! And the little ones were so small! We had never seen babies before, so that was a fun thrill for us. We love reading about your excellent adventures and admiring your world class photography. You’ve taken us places we never thought we would see! Keep trekking! Thank you so much, Wilson family! How fun to know that you all are following along. We’ve become quite addicted to trekking, so there will be plenty more adventures to come. So nice to hear from you! Wow! that is nothing like what I have seen the marmots doing in the US and Canada. Maybe they have altitude sickness in the Himalayans? Too cute. You know we never thought about the altitude causing their wacky behavior, but you must be on to something. You would have loved those cute babies! 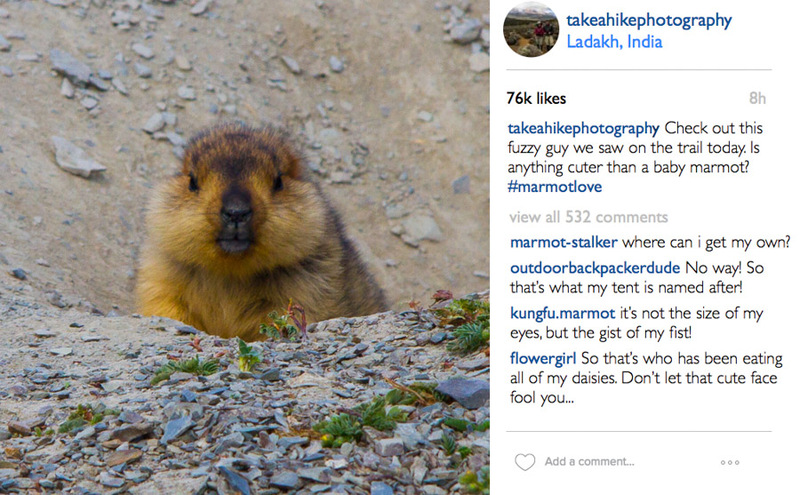 gorgeous shots of the adorable marmots and the commentary is hilarious. We are so happy you found it funny. We were hoping it might make at least one person laugh! Thanks so much for stopping by. Awesome! Thanks for the nice feedback. I enjoyed looking through your blog. Your bird photography is amazing! Absolutely amazing and fun post. With shots and video like that you either must have been working them like an orchestra or they decided they liked the looks of you and cranked it up a bunch. Either way it seems everyone was having a great time. That must have been a lot of fun. I’m happy for you. We hope we can get some more opportunities for “inner Lyle” posts soon. Now that you have published the recipe, we will be sure to follow it! Glad to know our efforts paid off. Thanks, Sandie! Adorable cubs.You are really lucky . Absolutely! We have seen lots of marmots in our days, but never babies. We couldn’t believe that the adults were nowhere to be seen, though. If I had a cute litter of marmots like that, I don’t think I would ever let them out of my sight! Very cute videos. 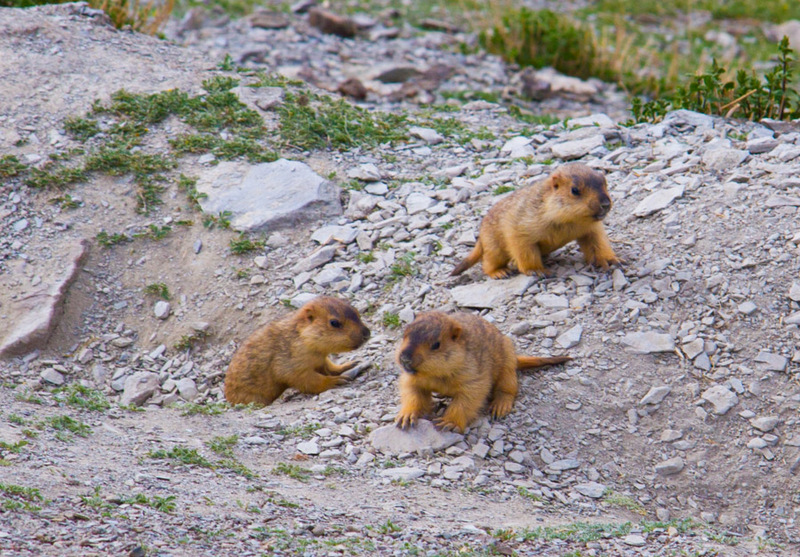 I loved when the baby marmots were playing outside with each other. Great nature scenes. You guys make great videos! We are so glad to hear that you liked the videos, Andy. There’s almost nothing cuter than a baby marmot! 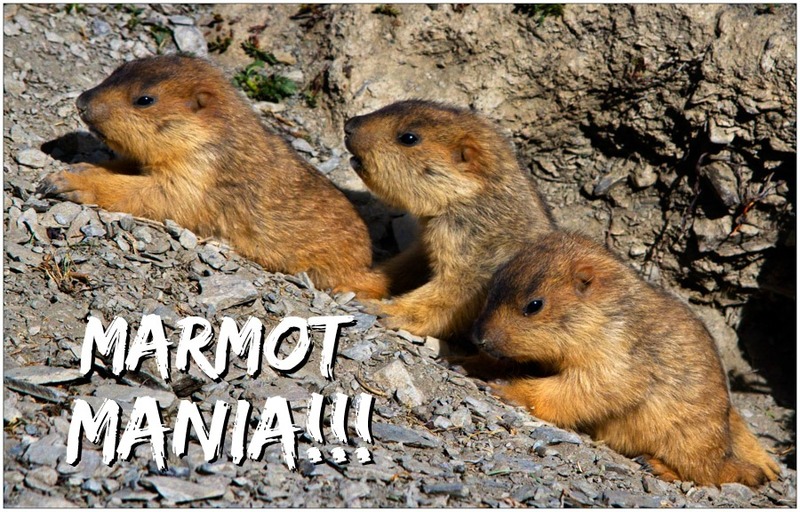 I love the marmots! I had a long distance glimpse of a marmot in Yosemite last year, but this year, we saw quite a few marmots and pikas in the Tetons, which was very exciting. I started following your blog after finding your post on Garden of the Gods. Thanks for the tips on campsites in the Pharaoh campground! Your photographs and videos are great. We may go to Iceland or Mt. Rainier next year, so I will definitely be looking over your older posts. Thanks for sharing! 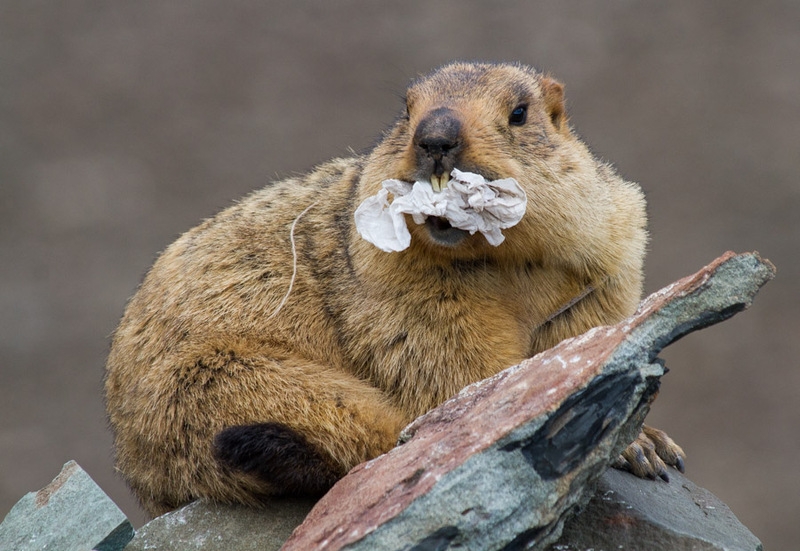 Marmots are one of our favorite mountain critters. We are glad you have had a chance to see them for yourself in the wild. Definitely feel free to use our site for gathering info about your future travels. And, if you have any questions about anywhere we’ve been, don’t be afraid to ask. We love talking travel. 🙂 Happy trails! I think this is just what the world needs to read to bring some laughter back. I don’t know what I love more, your photos, your narrative or the video. What a brilliant article. Loved it all! Thanks so much, Sue! We couldn’t agree more-marmots definitely make the world a better place, and we can’t wait for the opportunity to run into them again on the trail sometime soon. We really appreciate you stopping by our blog. Cheers!